Our range of products include aircast a60 ankle brace, air-stirrup 2 and airsport ankle brace. 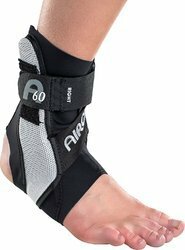 A60 by Aircast is an Ankle support which guards against rollover & helps prevent sprains. Breathe-o-prene fabric is an ideal in Hot & Humid ciuntry like India which keeps wearer cool & Dry. Sleek, anatomic design for a comfortable bulk-free fit.